Two of Elvis Presley's close friends have disputed claims that the rock icon made a secret visit to London. Lamar Fike and Marty Lacker, two of Presley's inner circle nicknamed the "Memphis Mafia", insist he never travelled to England. Veteran rock star Tommy Steele recently acknowledged a story that he took Presley on a secret tour of London. "My apologies to Tommy, but it did not happen," said Mr Fike, who was in the US army with Presley in Germany. "I was with him the whole time," he told the BBC News website. "I got there two days after he got there. He was confined to base." Presley did visit Paris and Munich during his 18 months in Germany, Mr Fike said, but added: "Had he gone to England, I'd have been there." Theatre producer Bill Kenwright recently told a BBC radio show that Presley flew into London for a day "when he was in the forces" and Steele showed him landmarks such as the Houses of Parliament. In a note to the Daily Mail newspaper, Steele said he "swore never to divulge publicly" what took place and "regrets" that news leaked out. "I can only hope he [Presley] can forgive me," he said. "It was an event shared by two young men sharing the same love of their music and the same thrill of achieving something unimaginable." 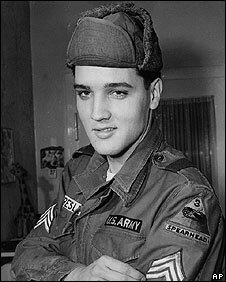 Presley joined the US Army in March 1958, and was stationed in Friedberg, Germany, from October 1958. His only confirmed visit to the UK was to Prestwick Airport, near Glasgow, where his aeroplane stopped to refuel on his way back to the US in 1960. Mr Fike was introduced to Presley by record pioneer Sam Phillips in 1954. "We just became very fast friends," he said. "I travelled with him and went to Hollywood with him in '57 and we did Jailhouse Rock. "Then when he went into the service, I tried to join because I wanted to be with him. We were just close, close friends." Mr Fike is about to publish a book about his time with the "King of Rock", called An Uncommon Journey. He has also written a screenplay based on his memoir which he said was currently being considered by five movie studios. "It will be a heck of a picture," he said. "It won't be any low budget picture, it's going to be an expensive picture."